My garden was out of control this year - not that I'm complaining! We had so much of everything, especially cucumbers, and so I was at a loss as to what to do with it all. Normally we have no problem eating the cucumbers, but we had so much and we just couldn't keep up. So I hit the web and my cookbook collection to try and find recipes for pickles. Make sure your jars and lids are sanitized before starting. Trim the cucumbers and quarter each of them lengthwise. Place in a large glass bowl with 2 tbsp of the kosher salt, cover and refrigerate for two hours. After the two hours rinse the cucumbers with fresh water and drain. Add the water and vinegar to a small saucepan with 1 tbsp of kosher salt and bring to a boil. 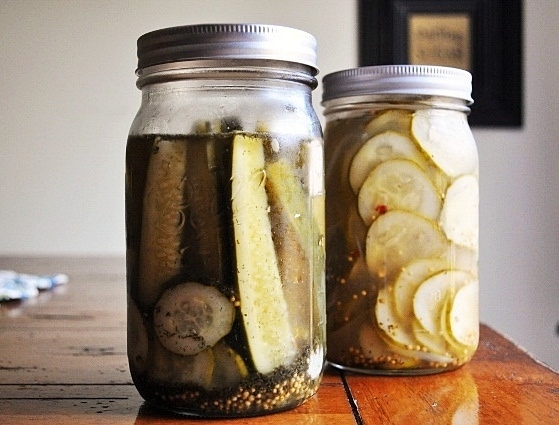 Place the cucumbers and the rest of the ingredients in your jars and pour the hot brine into the container. Let the pickles cool to room temperature, then cover and refrigerate for one day so the flavors can develop before eating. Make sure your jars and lids are sanitized before starting. Thinly slice your cucumbers and pack them into your jars along with the sliced onion. Add the vinegar, sugar, salt, mustard seeds, celery seeds and red pepper flakes to a small saucepan and bring to a boil. 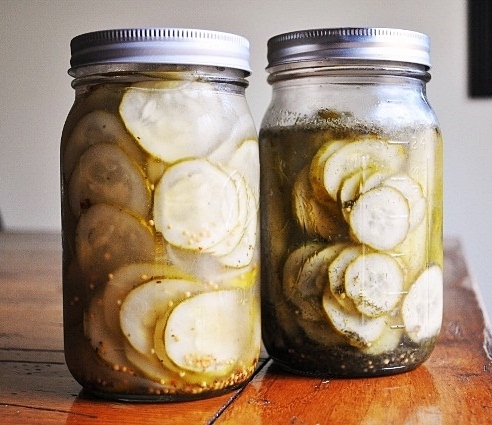 Pour the hot brine over your sliced pickles and let them cool to room temperature. Cover and refrigerate for one day so the flavors can develop before eating. These look wonderful. If I make them, I'll have to hide them from the kids. We can't keep a jar of pickles around here for more than a day before the kids eat them all.